During the Israeli War on Gaza in 2009, we were so terrified. I prayed for God to save our lives. AlhamdulAllah, He did. I am a Gazawi, from a large family of eleven brothers and one sister. My father is a poor farmer, but as is the case of so many of us here, he is now unemployed. Living in Gaza has been difficult since the Israeli Assault of 2009, and the inhumane Siege that have affected so many Gazan families. The lack of basic services such water and electricity are shocking us, medical supplies and medicines indispensable to treat our sick are in short supply creating a double humanitarian crisis. But my dreams of peace for my land stay in my heart and mind. My Goal is to inform people outside of Gaza, about the situation that we live in and to raise international awareness about the blockade of the Gaza Strip and to send a message to the international community to stop the support to Israel and stop the occupation of our land. We Gazawes along with all Palestinians are dreaming to break the siege and stop the suffering for Gaza. Gazans dreams to break the siege and stop the suffering is shared by all our Palestinians brothers in West Bank and in the world. May this year be a year of peace in Palestine! We Palestinians have the dream of live in peace, despite of having terrible experiences and reactions to the war, the siege, and the occupation. We have no borders, no life, we are all walled in and blockade. Life is full of difficulties and constant danger, and we are forced to live with so little and some of us with nothing. With the checkpoints and so many restrictions, there is no way out. We are trapped inside our own Land. However, I personally believe things can change, and I work toward that goal in every way I am able. I refuse to allow hope to die in me. I have dreams of finishing my degree in PT conflict resolution and of spreading the news about Gaza widely in such a way as to help my people and my land. I pray day and night to see my people’s face cheer up, expressing the love for each other in a peaceful condition. I have worked with the youth project in Khan Younis for demonstrating our rights in jobs, expressed in study. 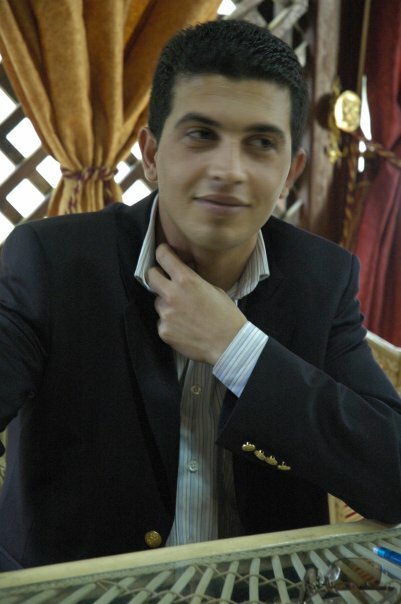 The EU youth Parliament nominated me as the member from Gaza to represent Gaza Youth in the “Berlin Conferences” in 2007 I was unable to attend due to the border restrictions and the Siege. Life for nearly all refugees in the Khan Younis Camp is more difficult because of the blockade of Gaza, with much higher unemployment. Fewer families can provide for themselves, leaving a staggering proportion of the population dependent on UNRWA’s food and cash assistance. Ninety per cent of the camp’s water is unfit for human consumption, so basic hygiene is another big concern. I worked for the American Friends Service Committee, training for responding to conflict situations, transforming the conflict to opportunities for young people, and encouraging peace on our side, so we can live our lives with various other trainings and experiences. I am now the Project Coordinator with Catholic Relief Services CRS, basically the Gaza Emergency and Recovery Project. as it is. In Catholic Relief Services we work with local partners in Jerusalem, the West Bank and Gaza and for nearly half a century. Our projects aim to support peace with justice for all people in this troubled region, while responding to the humanitarian and sustainable development needs of Palestinians. I do believe there is always a reason to hope and dream of peace despite whatever horrors are surrounding us. I am learning and hope to continue learning the tools needed to meet conflicts with resolution, teaching people to have hopes and dreams of peace, reconstructing peoples’ lives. Issam Sammour like thousands of young Palestinians cherish the dream to Study Abroad, it should not be a hard quest, why they have to see their future with so many obstacles?, from the signing of documents to the visa request, they have to go through hell is there no better word to designated their troubles. Israel makes almost impossible to fulfill the basic requirements to obtain the Passport and Visa, the check points on Ramallah and the blockade of Gaza are in the way. They can not travel to to other side of Palestine, there is a blockade a permanent check point on Erez. the point that divide Gaza Strip from the West Bank. And in Ramallah the friends that volunteer to help with the documents encounter countless obstacles as well. You need to live the everyday struggles to understand their state of mind. With an alarming rate of underemployment, preparing themselves for a better future is not a luxury but a necessity. They need to obtain higher education to be able to compete in so tight market. The situation in Gaza is worsened since Israel imposed a blockade, where does not let export or imports to cross and in complicity with Egypt have kept Gaza Strip impoverished to the point where more than 80 % of the population is in public assistance.